Potato peels are the sandwich crust of the spud world. Everyone wants to leave them behind. They hardly ever make it into mashed potatoes. They almost never make an appearance on French fries. They’re usually destined to be peeled off the potato and thrown in the trash. What a waste. Potato peels have so much more potential ― like being salted, doused with olive oil, baked in a 400-degree oven and turned into crispy, crunchy potato chips in under 15 minutes. Really good ones, too. That’s right, you’ve basically been throwing perfectly good potato chips into the trash all these years. But you can change all that today, with this potato peel recipe. The recipe uses the scraps from two potatoes, but the more potato peels you have, the better. Two potatoes will really only get you a small bowl ― still worth the effort ― but you’re going to want more than that. Trust us. 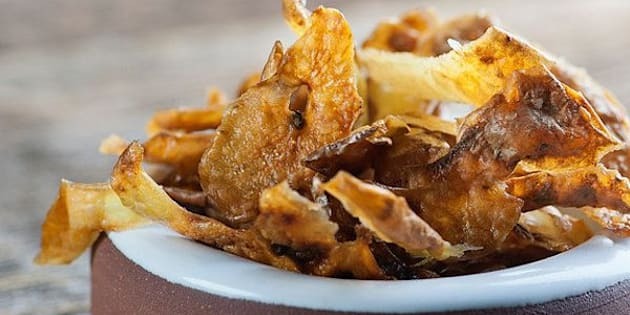 Get the recipe from food blogger Framed Cooks for potato peel chips.